45 Days Until A Multi Year Breakout For Precious Metals - Technical Traders Ltd. - Investment Strategies, Analysis & Intelligence for Seasoned Investors. Today is the day we want to warn our followers that we expect the precious metals to continue to base with a fairly narrow price range for about 45 to 65 more days before upside pricing pressures start to take hold of the markets. There has been quite a bit of chatter about Gold breaking above $1300 recently. Many people have been expecting it to move much higher fairly quickly. 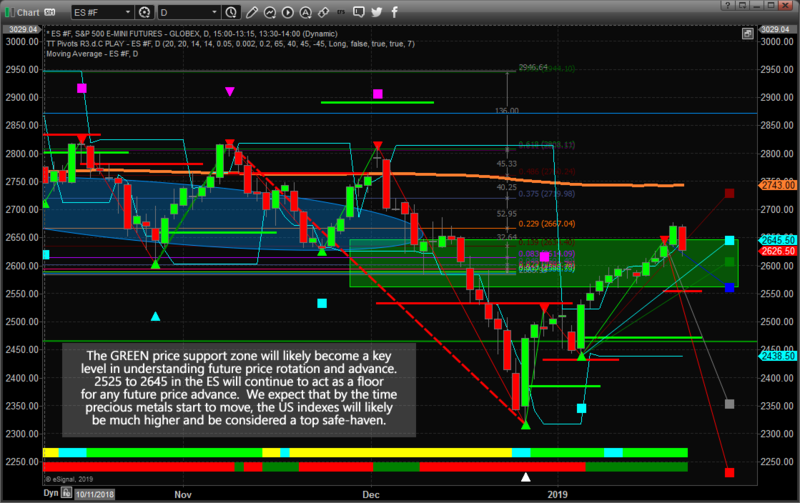 We don't believe that will be the case – but expect it have another significant rally in April, May or June. 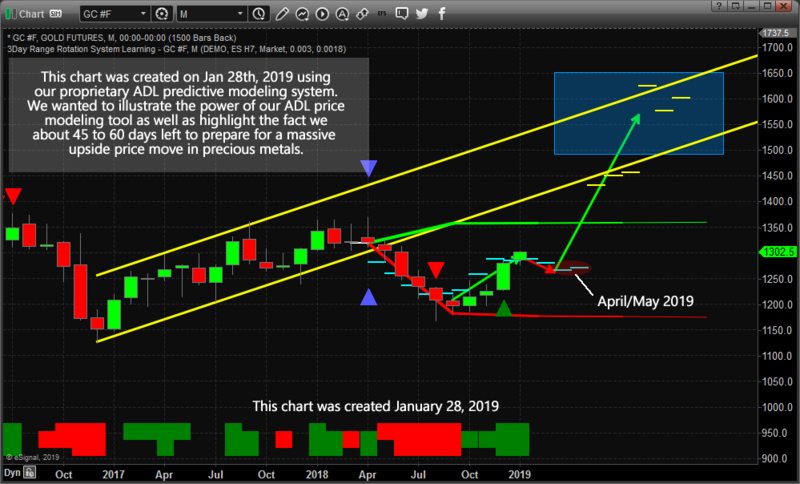 Back in early October 2018, we shared this chart with all of our followers suggesting that Gold and precious metals would rally to above $1300 near December/January using our Adaptive Dynamic Learning predictive modeling system. We've been suggesting to our followers for many months that Gold, Silver, and miners would begin a new upside price swing, yet we knew the big breakout moves were still many months away. If our analysis is correct, the US markets will settle into a melt-up format where global capital continues to pour into the US stock market in an attempt to avoid risks associated with global market slowdowns and events. This “capital shift” will continue to play out for the first 2 quarter of 2019 without much interruption. 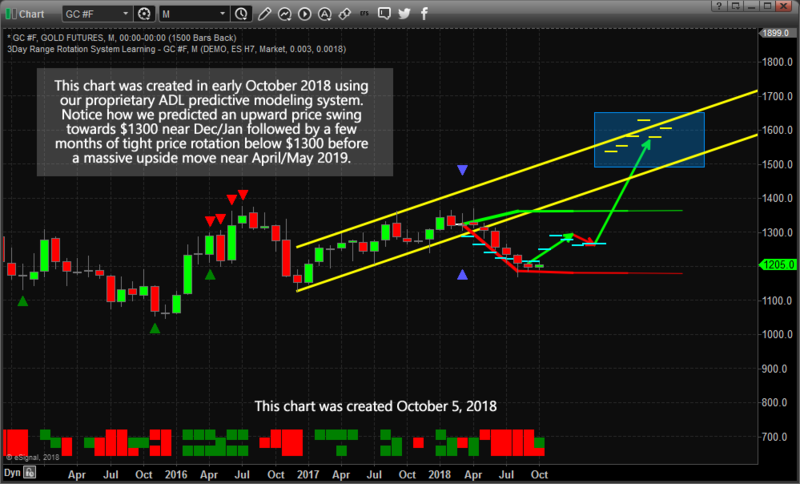 Our ADL predictive modeling system is suggesting that by May/June of 2019, precious metals should start to rally above $1400 and that means something is going to cause fear in the markets. It could be the US Presidential election cycle spinning up or it could be something external – we don't know yet. We do know that the Brexit date, March 29, 2019, is likely to spark some renewed fears in the global markets and we are eagerly watching the news cycles to see what is next.